When I first saw these little gems in La Cucina Italiana, the Italian kitchen magazine, I knew I was destined to try them in my own kitchen. French for “windblown,” a vol-au-vent is a small, very light and hollow pastry. They’re essentially made by cutting puff pastry into shapes, then cutting a hole in one of them before stacking the one with the hole (circle cut-out) on top of the other. Vol-au-vents can be filled and made into savory appetizers or sweet desserts. 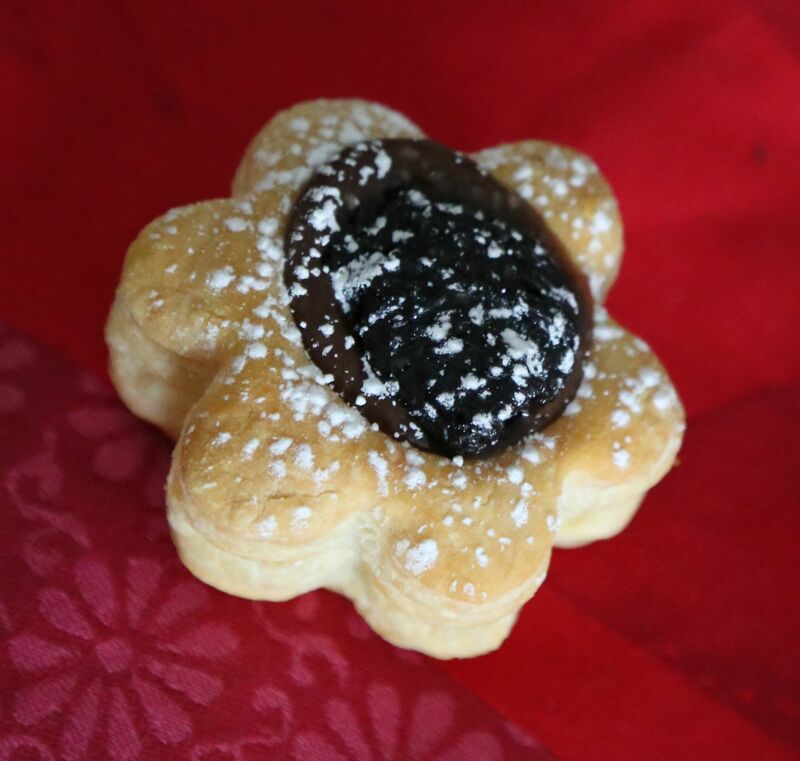 Here, these airy and flaky sweet pastries are filled with gianduia (Italian hazelnut chocolate) cream and prunes bathed warmly in red wine. SPECIAL EQUIPMENT: parchment paper; a 3-inch flower-shaped or round cutter; a 1¼-inch round cutter. Heat oven to 400 degrees Fahrenheit with rack in middle. Line a baking sheet with parchment paper. In a small saucepan, combine prunes, 2 tablespoons sugar, Marsala and ¼ cup water. Bring to a gentle simmer; cook, stirring occasionally, until liquid is syrupy and prunes are tender, about 15 minutes. Remove from heat; set aside. Meanwhile, place gianduia in a medium bowl, whisk together remaining 3 tablespoons sugar, egg yolks, flour, vanilla and salt. In a small saucepan, heat milk just to a simmer, then, whisking vigorously, in a slow and steady stream add milk to egg yolk mixture. Return mixture to saucepan. Cook over medium-low heat, whisking occasionally, until smooth and slightly thickened, about 2 minutes. Remove from heat, then force mixture through a medium-mesh sieve into bowl with chopped gianduia. Stir together to form smooth chocolate cram; set aside. Using 3-inch cutter, cut out 12 rounds from puff pastry sheets. Using 1¼-inch cutter, cut out center from 6 of the rounds; discard center pieces. Transfer pastry rounds without cutouts to prepared baking sheet, placing them about ¾-inch apart, then stack rounds with cutouts on top. Bake until puffed and golden, about 20 minutes. Let cool on wire rack for 2 minutes, then transfer to serving platter. 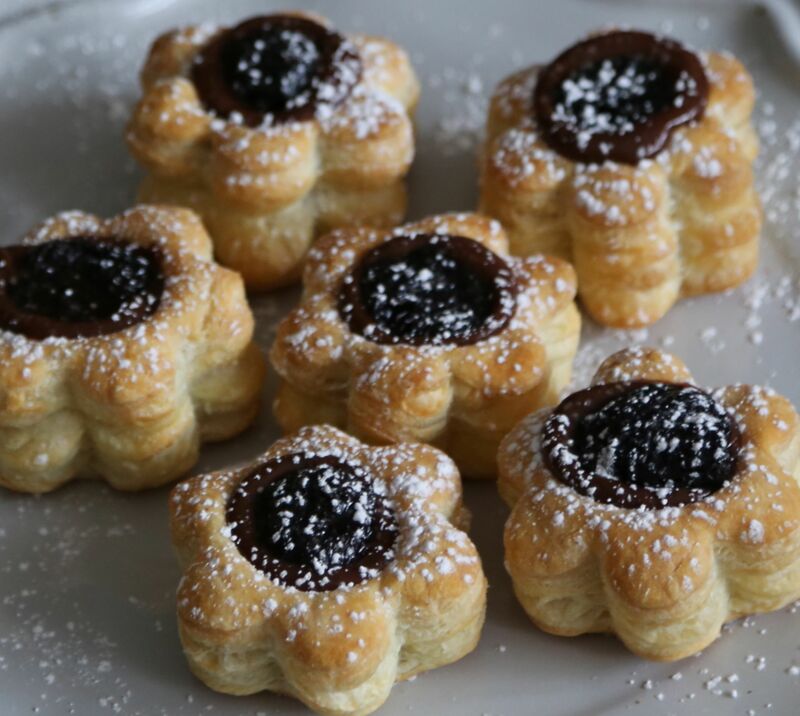 Gently push down center of the pastries to create an indent, then fill with chocolate cream and prunes. Dust with confectioners sugar. Serve immediately. Martine’s Notes: As I did not have Marsala wine, I used a Pinot Noir as a substitute. As a reminder we’ll be having our first book club discussion in March on Thrive: Finding Happiness the Blue Zones Way by Dan Buettner. I hope you’ll join us. They look stunning, Martine! What a treat they must have been. Btw, can’t see the video, hon. It’s marked private. Is that how it’s supposed to be? Thanks Angie. Sorry about that, it wasn’t supposed to be private. I thought I had fixed it before retiring for the night…. The vol-au-vents were a treat to make, indeed. I look forward to making them again, but next time with perhaps a savory filling! Can’t see the video, it’s just blackness, btw. Thanks Mandy. Sorry about the video glitch. I’m still learning….The video should be available now. And glad you liked the pastry. They were a lot of fun to make, pretty easy too! Worked this time, operator error 🙂 Makes me miss pumpkin bars, your LL apartment, chatting instead of going to class, & of course you. Love the video! At first, it paused but then when I restarted it, it went through to the end. You look as beautiful as ever! I too love your photographs and am learning from them. Sharing your techniques would be very appreciated. I’ve started practicing with table top arrangements and have wondered how to get the lighting the way I want. Thank you now for sharing your knowledge. I believe you are past amateur! Maybe more apprentice? I would love to try the dessert but for the next six weeks sugar is off-limits–in all its forms. In just two short weeks I’ve noticed that I no longer have “crashes” when I haven’t eaten. I never knew how bad I felt before until I genuinely started feeling better from the foods I ate, the way I prepared them, and when I ate them. Well-being and happiness are not an accident or the result of positive thinking. It is purposeful. And it can be lasting. Hurrah! BTW how will your book club work? I’m used to book club members meeting at someone’s home. Thank you Josephine! I should have also mentioned that I don’t have a lot of techniques. Really, I think I’ve been lucky but I’m happy to share any wisdom and tips I’ve gleaned over the years of taking photos of things I love! 🙂 You are so right, well-being and happiness is something we must purposefully practice to achieve everyday. I wish you all the best as you continue to learn what foods are best for you. Have you read any of Rick Hanson’s books on the changing the brain for happiness? As for the book club, I too am used to the format of book club members meeting at someone’s home. Since that will be impossible for us here, I’ll try to post a video discussing my thoughts and then hopefully we can have a discussion by way of comments. I know it’s not ideal but that’s my idea so far. Love to you! Thanks so much Asmae. The videos are definitely a learning process…. Let’s get together soon! I’d love to see you again. Thank you so much Fae. Your absolutely right and your two cents are worth a lot! 🙂 I thought that I should change the name of the video to avoid confusion in the future, but couldn’t decide on a more fitting name. I’ll try to be better at labeling videos in the future. Thanks again. I really do appreciate the feedback! Hi Fae, I was happy to find out that it wasn’t too late for me to change the title of the video. I’m still learning…. 🙂 I just changed it. Thanks again!